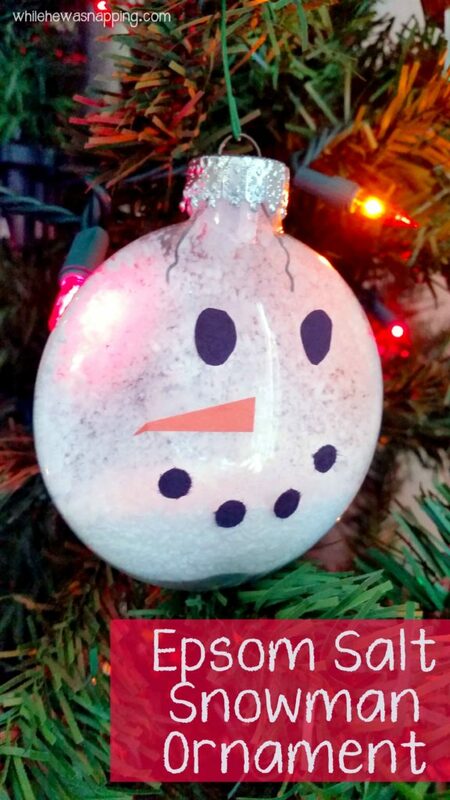 This snowman ornament turned out cuter than expected, considering the simple materials. And that it was kind of a last-ditch effort to salvage the ornament I originally made. The original wasn’t as awesome as I’d pictured and I was rather disappointed with it at first. 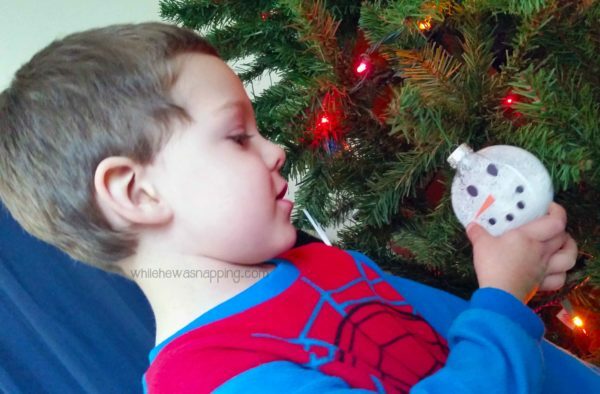 Luckily, attempt #2 turned out much better in the form of this cute snowman ornament. Quick, easy and cute. Just my kind of craft. Ready to make yours? – Take the cap off the ornament carefully and set it aside. Pour some glue into the ornament. If you want the salts only on one side like I did it, be careful and only get glue on one side of the ornament. 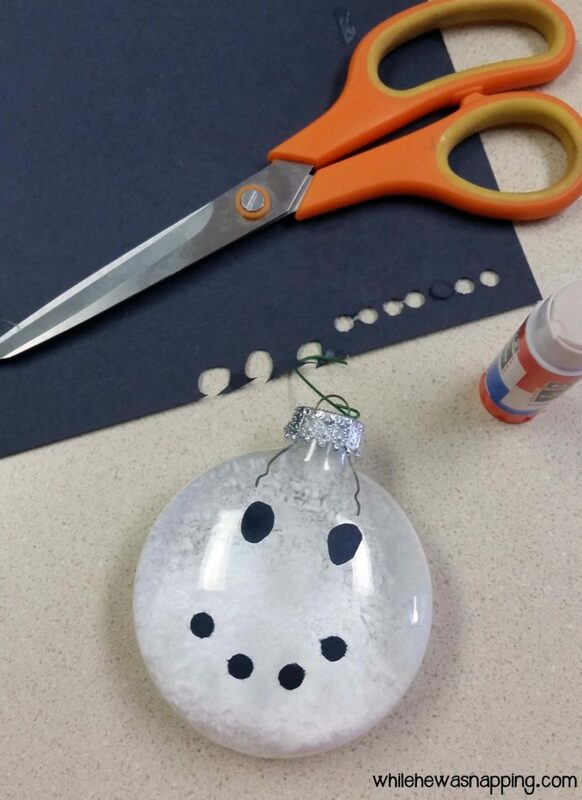 If you want the whole thing to have salts on it, pour the glue in and spread it around the entire ornament. 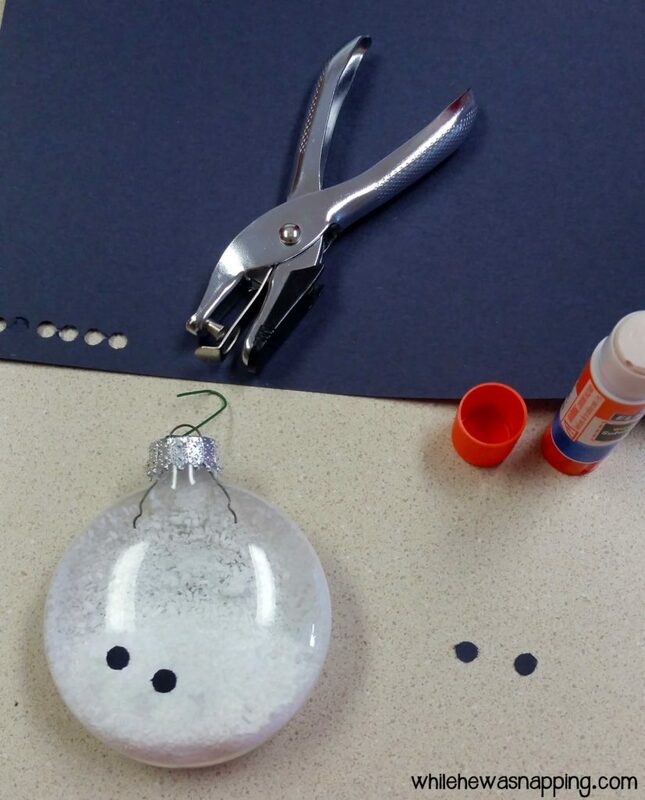 – Pour Epsom salt into the ornament and shake the ornament until salt covers all the glue. I left a little extra in the glass ornament too. You can leave it or empty it out, your choice. – Use the hole punch to punch out circles from the black construction paper. If you want larger eyes (like I did) use the scissors to cut larger circles for the eyes also from the black construction paper. 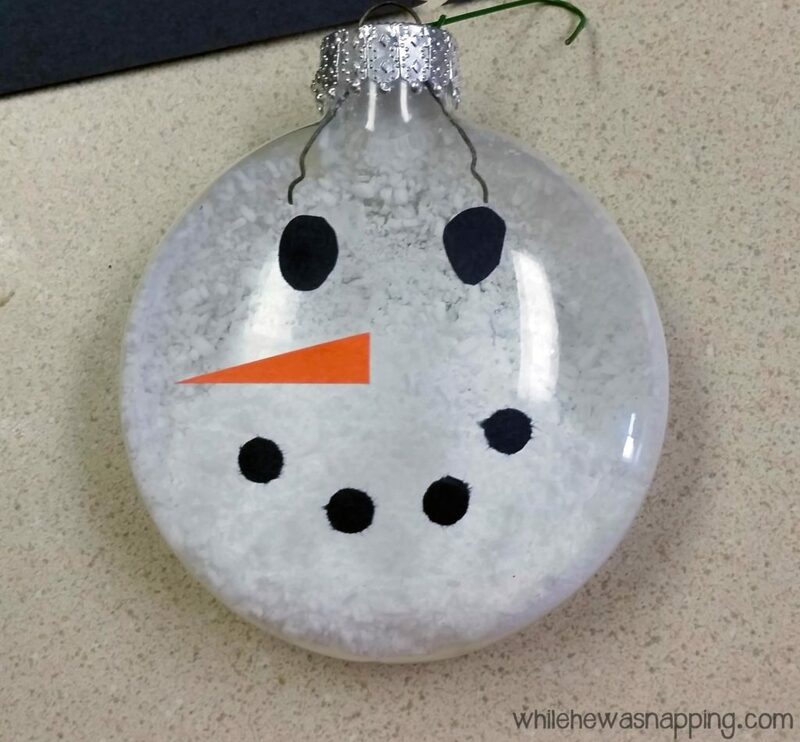 – Use the glue to put the eyes and mouth on the outside of the glass ornament. – Cut a small triangle from the orange construction paper for the nose. Glue it on with the glue too. 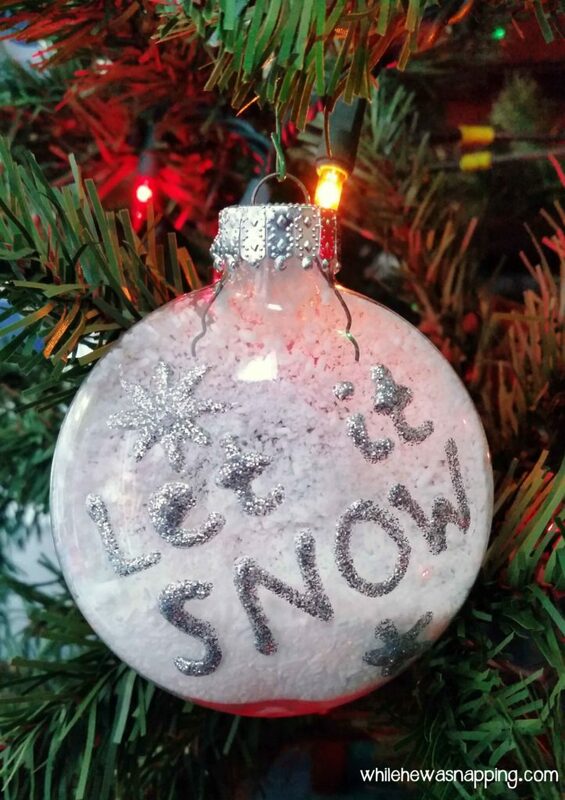 – Let the glue and Epsom salt dry and then carefully put the cap back on the top of the ornament. Attach a hook and hang on the tree. That’s it. Who knew construction paper would work so well?! I was hoping to use craft foam to give it a little more dimension, but I didn’t have orange… or black. So, I improvised with the paper and it still turned out great. If the snowman pieces fall off I’ll use hot glue to stick them back on. I haven’t had a problem with them yet though. Despite the fact that my baby played Godzilla with the tree yesterday. Even attempted to ascend to the tip top… that boy will be the death of me. This was simple enough that my boys could have helped. They didn’t… because they were sent to bed early. We need to sing “Santa Claus is coming to Town” more often it seems. A more frequent reminder of all that’s at stake seems to be necessary. Little J was pretty disappointed he didn’t get to make one… he thought they turned out great and wouldn’t stop touching it. His smile is pure joy. It’s my favorite. All snowmen need a scarf, right? This little guy might get this little accessory in a day or two. 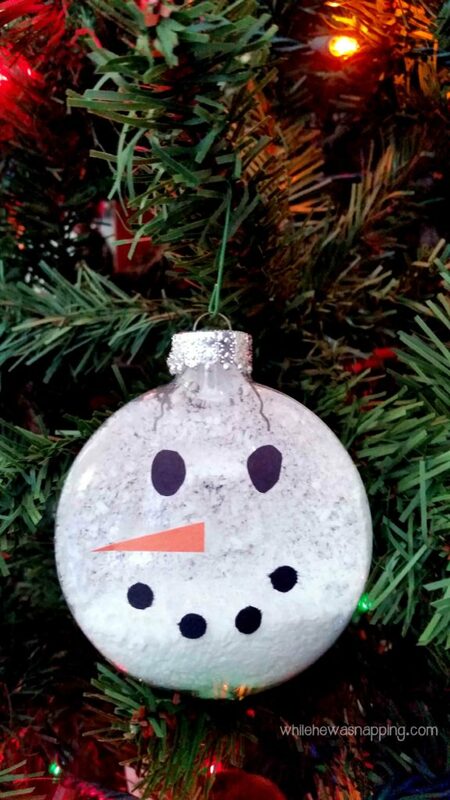 And I just know you’re dying to know what was so awful with the first ornament that I had to try again… go ahead. You be the judge.